Robin Orr was born in Brechin in 1909 and studied at the Royal College of Music, Cambridge University and with Nadia Boulanger and Alfredo Casella. From 1938 to 1956 he was Organist and Director of Music at St John's College, Cambridge. He has taught at the University of Cambridge, the Royal College of Music, and at the University of Glasgow where he was Professor of Music, subsequently becoming the first Chairman of Scottish Opera, a post which he held for fifteen years. In 1965 he was appointed Professor of Music at the University of Cambridge. He retired in 1976. Among his many honours are Honorary Fellowships at St John's College and Pembroke College, Cambridge, and he was made CBE in 1972. Professor Orr has written three symphonies, three operas, and has received important commissions from Peter Pears and Dame Janet Baker. He has also made a significant contribution to Anglican church music. 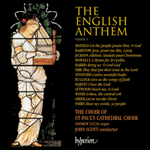 The anthem They that put their trust in the Lord was composed in memory of those members of St John's College, Cambridge, who lost their lives in the Second World War. The mood of the work is traditional in outlook, although the key structure is unusual, which lends an original quality to the profound calm of the work. They that put their trust in the Lord shall be even as the mount Sion, which may not be removed, but standeth fast for ever. The hills stand about Jerusalem: even so standeth the Lord about his people, from this time forth for evermore.